Teach children to behave nicely at mealtime. Avoid pressuring children to eat. Does Saskatchewan have a surveillance system for ticks? More than 97% of the ticks submitted to the surveillance system are the American dog tick (also known as "wood ticks"). Less than 1% of the ticks submitted are the blacklegged tick (also known as the "deer tick"). These ticks are more commonly found in parts of British Columbia, Manitoba, Eastern Canada, and parts of the United States but can hitchhike into Saskatchewan on migratory birds. What can you do to protect yourself from ticks? Wear clothing that covers as much of your skin as possible (long sleeves/pants, closed toed shoes, hats, etc.) and wear light coloured clothing to make the ticks easier to spot. Tuck your pants into socks and wear shirts that fit tightly around your wrists. Avoid walking, working, playing in long grass and overgrown brush; stay in the centre of the trail when hiking. Keep your pets out of the wooded areas and long grass. Regularly check yourself, your children, and your pets for ticks before coming indoors. Remove clothes, shower, and do a thorough tick check. Wash and dry all clothes on the hottest setting to kill any ticks left on clothes. How can I remove ticks? Remove attached ticks as soon as you find them. Use fine-tipped tweezers to grab the head and mouth as close to the skin as possible. 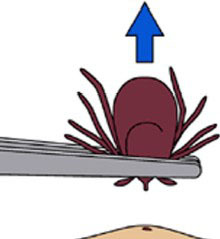 Pull up slowly with steady pressure until the tick is completely removed from the skin. Do not twist or jerk the tick. Make sure the whole tick is removed. Wash the bite area with soap and water or disinfect with alcohol or household antiseptic. Avoid using nail polish, petroleum jelly, or heat to make the tick detach from the skin. What are the health risks from a tick bite? Most tick bites do not cause disease. Completely removing the tick as soon as possible helps prevent a skin infection where you were bit. The health risks from bites from the wood tick: There are no significant risks from these bites but some people can develop a mild allergic reaction with itching, redness, and swelling. The health risks from bites from the blacklegged tick: A very small percentage of blacklegged ticks carry the bacteria that can cause Lyme disease. 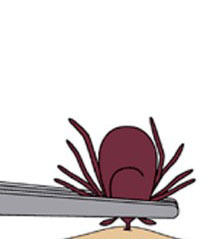 In most cases, the tick must be attached for 36-48 hours or more before the Lyme disease bacterium can be transmitted. Most of these ticks do not carry the bacteria that can cause Lyme disease. If you have symptoms you are concerned about following a tick bite you should contact Saskatchewan HealthLine at 1-877-800-0002 or speak with your health care provider. Have there been any cases of Lyme disease in Saskatchewan? In Saskatchewan, there have been a few cases of Lyme disease. Most of these of these cases are related to travel to areas where the blacklegged tick and Lyme disease is more common. A recent case of Lyme disease was most likely acquired in Saskatchewan.